Ella is a laidback town perched high in the south-eastern hills of Sri Lanka’s tea country. It boasts many opportunities for walking and mountain biking, along a variety of trails through the picturesque tea estates, as well as exciting hiking excursions up Little Adam’s Peak and the more challenging Ella Rock. From the top of these peaks, you can gaze across the Ella Gap, taking in the awe-inspiring views of forest-covered mountains, rolling tea hills and scattered waterfalls – on a clear day you can even see all the way down to Uda Walawe National Park and catch the sea glimmering on the horizon. Explore Ella on foot and let your mind wander as you take in your spectacular surroundings and absorb the atmosphere of utter tranquility. Visit nearby Ravana Falls – bathe in the shaded plunge pool, or (in the dry season) hike up to the top. 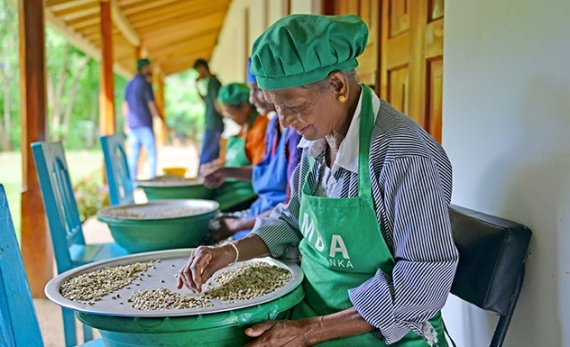 Other things to do in Ella include visiting a tea factory or taking the train to Kandy. Ravana Falls, just outside Ella, are said to be the place King Ravana kept Princess Sita prisoner in the mythological Hindu epic ‘Ramayana’.